I found this rather amusing little video at Isch2k.net. Since it features a penguin you know it has to be posted here on the blog. Plus, I recently got an e-mail from Isch2k complaining that there aren't enough incoming hits to their site from mine. They even suggested I place their damned link in a more prominent place on my site, as if the blogroll isn't enough. So, please, click the link for the video. Click the link to Isch2k. Click the hell out of something here in this post! Bear in mind, I don't post a lot from this site because there's a lot of not safe for work stuff there. In any event, they're linked to me and I shoudl do something to let them know I care. 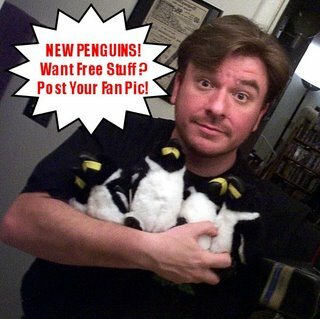 And if you like the penguin action, check out this post from Golfwidow. Ahhh...Remember the good ol' days when people would get free stuff from me and then read & comment regularly? I loves me some Golfwidow! Speaking of this fine lady, have you listened to our recent podcrap yet? I know I have and I LOVED it. Of course, I'm biased. Here's another hint for the blog contest that is apparently impossible to figure out. This mystery anniversary...the one year anniversary that I had on November 8th and will get to enjoy again on the 18th...pertains to something I talk about often here at the blog. If only there were a way to figure out what I was doing a year ago. Love the new promo shots. Family. Unrefined. Most appropriate. Love it. B, it's your speakers. I'm left channel and Andy's right channel. Try earphones, that oughta fix it. Editing Andy out. What purpose would that serve? He's the only good thing IN the podcast. Sheesh. Will do, GW because I *know* he's on the other speaker, it just isn't coming through, but the faint notice of another voice was lurking there. :) Andy suggested the same. WooHoo another Happy Friday link! Cool little video.